Images taken from Loot Crate announcement email. Interesting franchises for this month. I’m familiar with everything except for the Uncharted series. 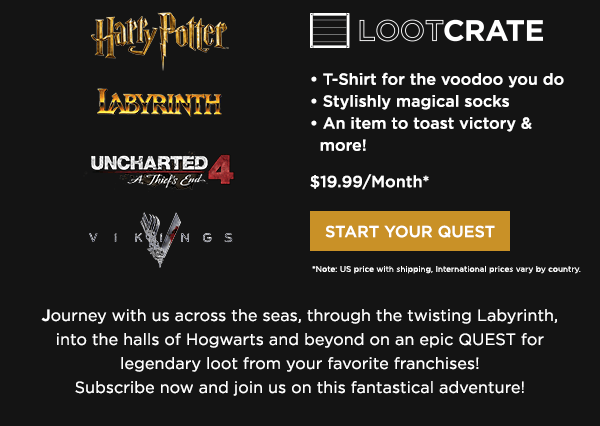 I know Uncharted 4 gets released in May, but maybe Loot Crate is trying to hype the release. Going off the email, the shirt is probably from Labyrinth since David Bowie refers to voodoo in the song “Magic Dance”. The socks will probably be from Harry Potter and the “toast” item will probably a cup of some sort from Vikings. Not sure what the Uncharted item will be but I can’t wait to find out.